Take the Health Reform Quiz! 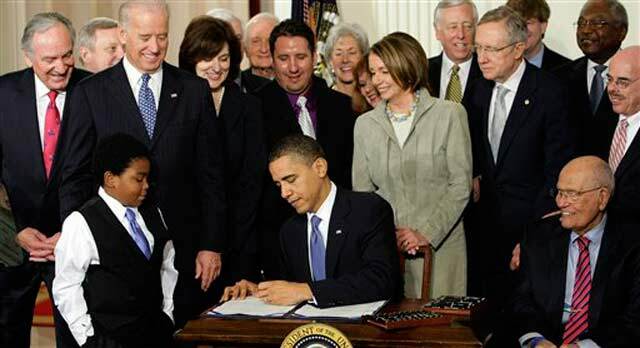 Take our ten-question quiz and find out how much you know about the Affordable Care Act! President Obama taking our quiz on the new health reform law (we assume). #1. The Affordable Care Act will prevent insurance companies from denying coverage or charging people more because of pre-existing conditions. #2. The Affordable Care Act reduces the deficit. #3. Under the new law, all businesses, even the smallest ones, will be required to provide health care for their employees. #4. Most people will see their taxes go up as a result of the new law. #5. All young adults can now stay on their parents’ insurance until they turn 26. #6. The health reform law creates a new government run insurance plan to be offered along with private plans. #7. The health reform law will require nearly all Americans to have health insurance starting in 2014 or else pay a fine. #8. The new law doesn’t protect veterans’ benefits. Veterans will be forced to buy private coverage or pay the tax penalty under the individual mandate. #9. The health reform law allow a government panel to make decisions about end-of-life care for people on Medicare. #10 The health reform law is based on plans that Republicans supported in the past.